Prolink has released a new feature request page on our website. It allows you to request features and vote for those features you want. Product Spotlight: SPC Office Buddy 3.4 Released!! Prolink is proud to report we have released SPC Office Buddy 3.4. The new Buddy looks a lot like the old Buddy but includes new features that make it an even more useful tool! Here is a partial list of new features. 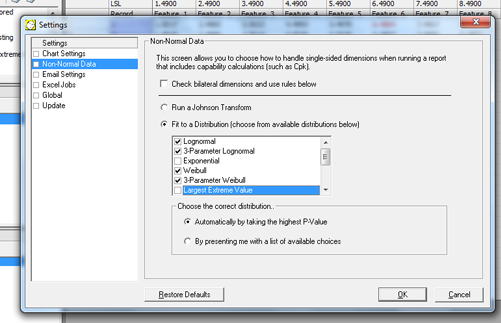 New ability to automatically run Minitab Fit Distributions for non-normal dimensions, choose the best P-Value (or present you with your options), and then run non-normal SixPacks and Capability Analyses with one click. New reports including Individual Distribution Identification, 1-Sample T and 2-Sample T.
The addition of named factors in Excel Jobs. Now you can call your factors by name rather than ordinal position. New query governors introduced in the record filtering allowing for faster performance of complex filters on large databases. QC-PLC was officially released in the fall of 2012 and has already generated a lot of interest. Make it a point to check out our new data collection with native PLC drivers for Allen Bradley, Modbus, Siemens, and GE Fanuc PLCs. We are currently scheduling regular demos via our website using our Allen Bradley PLC. Tip: Run Excel Jobs in the Buddy from ERS!! An important new feature that was added to ERS in the fall of 2012 was the ability to export raw data to various ASCII text formats. Along with this we created the ability to export your data to QCC files and run your Excel Jobs in the Office Buddy. The only requirement is that you have both the SPC Office Buddy and ERS installed on the same PC. This is one of the most powerful enhancements that was added to ERS last year. Here are two main reasons for the change. 1. You now have the full power of ERS filtering and grouping which allows you to combine the data across dimensions, parts, or plants. 2. It effectively allows you to produce reports in almost any format (since it's good ol' Excel after all). Create an Export Job in ERS the normal way. Name it, choose your data group(s), global filter, etc. 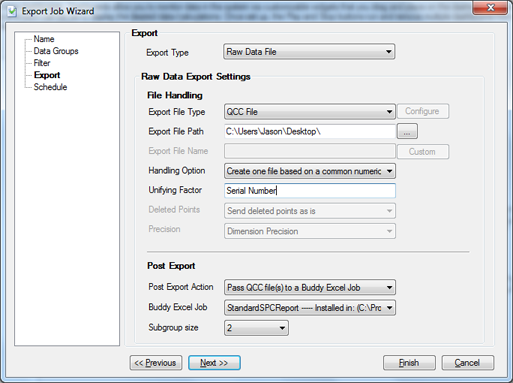 On the Export screen in the wizard, change the Export Type to Raw Data File. Choose QCC File as the Export File Type and select an output path. I've chosen my Desktop above. Choose your handling option. Since you will likely have multiple QCC files in the same data group, you can choose to combine them by selecting a common factor (such as serial number). Alternately, you can choose not to combine them and run them all separately. In the Post Export section choose Pass QCC file(s) to a Buddy Excel Job. Choose the Buddy Excel Job from the following drop down list. Finish the wizard via the scheduling screen. That's it. Your Export Job will run on the schedule you provided, gather the data from your data groups in SQL Server, export the data per your requirements to QCC file(s), launch the Buddy and pass those QCC files to it along with commands to run the Excel Job of your choice. The Buddy will then launch Minitab (if there is charting) and Excel creating your reports.